The top-ranked Crimson Tide’s master motivator would like a little bad press to help keep his team grounded. It’s been that kind of start for Alabama’s season. 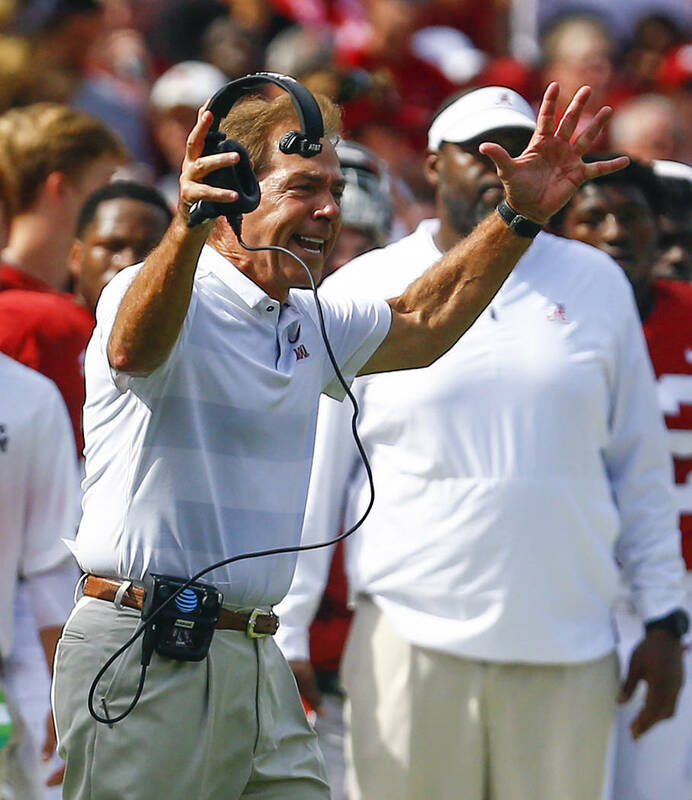 TUSCALOOSA, Ala. — Alabama coach Nick Saban had one last request before leaving the podium following the latest lopsided win: Go negative. Please. The top-ranked Crimson Tide’s master motivator would like a little bad press to help keep his team grounded. It’s been that kind of start for Alabama’s season. Saturday’s 45-23 win over Texas A&M amounted to the closest game yet by a couple of touchdowns. “I’d appreciate it if you would sort of look at some of the things that we didn’t do so well and write about that so maybe I could show it to the players and say, ‘Look here, man. Here’s something you can do better,’” Saban told reporters. The reporters laughed. He didn’t. The Tide (4-0, 2-0 Southeastern Conference) didn’t have a cakewalk against the Aggies (2-2, 0-1) compared to then previous three games, at least. Then again, those were decided by scores of 51-14 (Louisville), 57-7 (Arkansas State) and 62-7 (Mississippi). From a coach’s standpoint, those margins of victory don’t obscure things his team can do better. Saban’s comments were very mild compared to his “rat poison” rant about the team buying into its own hype following the win over Texas A&M two years ago. But he did want to make a point. 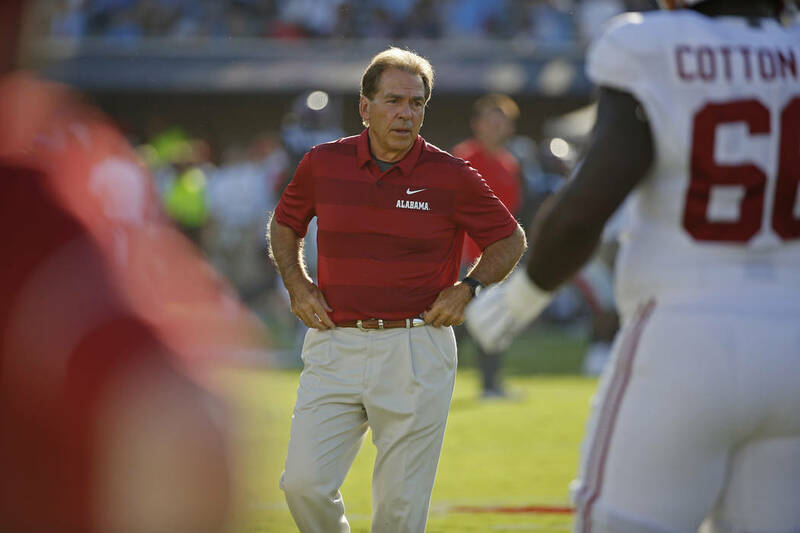 “We’ve got a good team and our team needs to do a lot to improve,” Saban said. “And if what our team has accomplished to this point makes them in any way not take into account the kind of teams that we have to play in the future, and they underestimate what we need to do to improve so that we can become a better team and don’t just take things for granted — that we’re going to show up because we’ve got an Alabama uniform on and win the game, it’s not going to happen that way. The cold, hard truth is, Alabama will be heavily favored in its upcoming games against Louisiana, at Arkansas, against Missouri and at Tennessee. Sorry, coach. 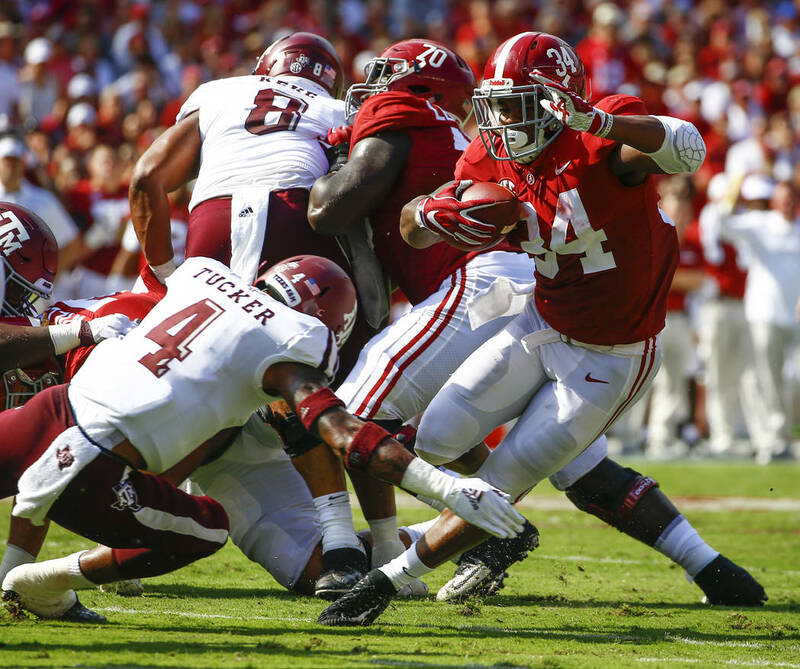 —Alabama gained a modest 109 yards on 28 rushes, despite a 35-yarder by Damien Harris. —Sure, Tua Tagovailoa passed for 387 yards and four touchdowns and ran for another score, but he couldn’t maintain his 13-of-13 passing streak on third downs. In fact, Alabama converted just 4 of 10 third-down attempts. Tagovailoa was a more human 4 of 7 with three conversions and another on the ground. —Which brings us to … punting. With JK Scott gone, Alabama ranks 88th in net punting. Skyler DeLong averaged 36 yards on six punts. —Texas A&M quarterback Kellen Mond had some long runs, including a 54-yarder. He netted 98 yards despite seven sacks. Tide players embrace Saban’s ability — and frequent willingness — to point out flaws and keep the team from getting too full of itself . How good is Saban at pointing out the flaws?